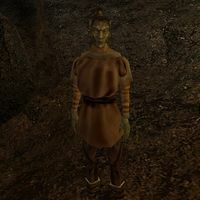 Meder Nulen is a Dunmer pawnbroker working for the Camonna Tong at their hideout in Nevrila Areloth's house in Sadrith Mora. He has a variety of goods for sale, but you're probably better off doing business elsewhere, given the Camonna Tong's attitude towards outlanders. This page was last modified on 24 January 2014, at 03:52.